I made borshch the other night and we ended up with leftover sour cream. 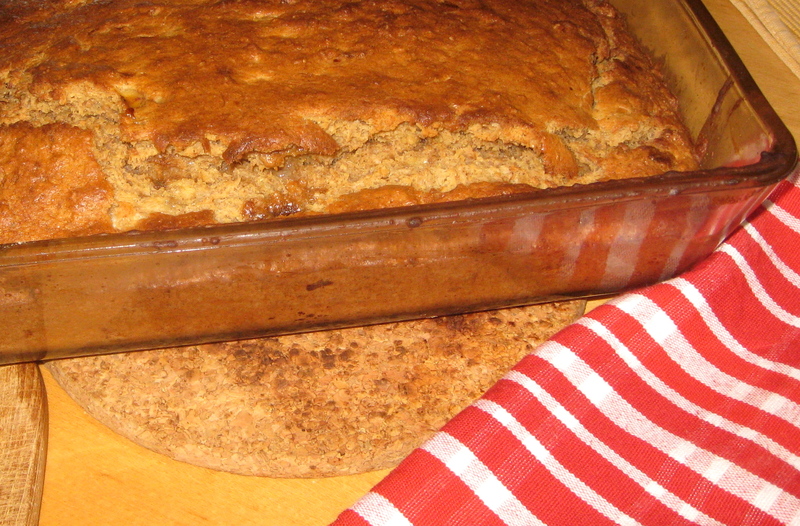 First I thought about making a coffee cake with it, but then I saw the three super-ripe bananas sitting on the table and thought, “I bet I could make banana bread with sour cream; it’s sort of similar to yogurt.” A quick Google recipe search confirmed my hunch, so I modified my go-to banana bread recipe slightly to accommodate sour cream. I also made it a bit healthier by adding whole wheat flour and cornmeal. In a medium bowl, mash the bananas and stir in the rest of the wet ingredients (through butter). Stir the wet ingredients into the dry ones until just combined. Gently stir in the nuts/chocolate, if using. Bake for 45-55 minutes or until a knife inserted comes out clean. This entry was posted in food, health, pictures, recipes and tagged breakfast, brunch on 21.06.2013 by taplatt. Thank you — it certainly is! I might make banana bread with sour cream from now on.